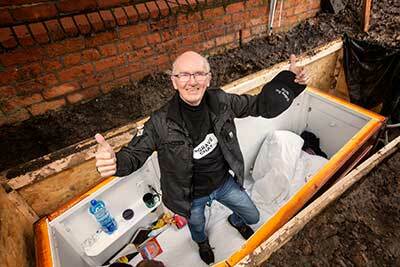 Situated in the grounds of Willowfield Parish Church in Belfast, John has been speaking, not so much from beyond the grave but from an actual coffin, buried four feet under the soil. “Over the years, I’ve attended a number of funerals. But the most heartbreaking are those of young people who have taken their own lives,” he says. “The devastation suffered by their grieving families is beyond words. I wanted to find a way to reach out to our youth, to get their attention and make them take notice. No doubt the 61-year-old grandfather would find it easier to deliver God’s message of hope from the pulpit of his home church in Harrogate. But John’s life has been remarkably short on comfort. “By the time I hit my teens, I thought I’d found a solution for the angst and insecurities of my life. The instant buzz from drugs was like magic. John can never forget the profound loneliness of that time. The death of his father in 1984 proved a turning point. In his quest for sobriety, John lurched from one therapy to another. His odyssey led him to a variety of experts, AA meetings, charitable organisations and even a padded cell in a psychiatric unit. But it wasn’t until 1987 when he stumbled into a Christian meeting that he found the freedom he craved. “Somehow, I wandered into what I later discovered was a Full Gospel Business Men’s Fellowship meeting. The speaker talked about freedom through Christ and I wondered if God could possibly help me. “During worship, I cried out to him and asked for forgiveness and deliverance. Words cannot describe the amazing event that took place within me. Since then, John has been on a mission to reach others, especially the young. Under the umbrella of the charity Father’s Heart Ministry, he has taken part in a number of events, including a walk across Ireland, to raise awareness of the problems facing today’s youth. “Kids are under more pressure than ever before. The family unit has changed, bringing new dynamics and challenges for the youngsters involved. “They struggle to be accepted by their peers, but also with the pressures of the media and internet. “In this complex world, I believe the Church has failed our youth. We need to step up and take responsibility. From his custom built coffin (2.4m x 1m x 1.3m) John spent three days, live streaming to a global audience. Apart from a caravan toilet, his underground home was far from luxurious. So, was it worth it? “Most definitely! I climbed out of the coffin, stiff, sore and in need of a bath. But through this event I have made contact with so many hurting people who need help – practically as well as spiritually. “My mission, whether it’s walking the countryside or through a chat from a ‘grave’ is to reach those living on the edge. “I want them to know that regardless of the problem, suicide is not the solution. The answer can always be found in God’s love.